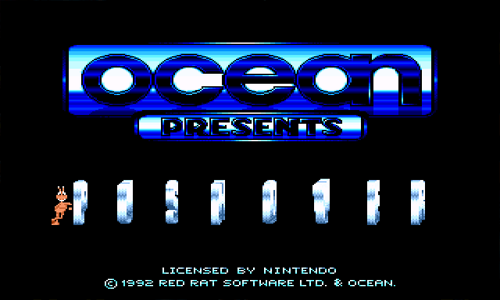 Publisher: Ocean Software. Developer: Red Rat Software. Other versions: AMI; AST; PC. Usually when games are sponsored by outside brands, the end results are less than flattering. 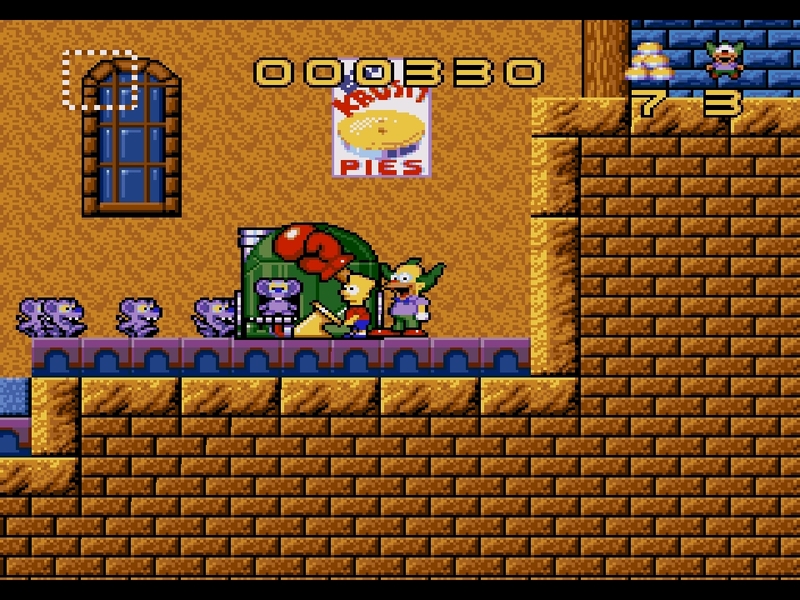 Thankfully, the SNES version of Pushover is spared this fate, giving it a bit of a better chance. Though branded by Quavers in other versions of the game, we merely follow the exploits of G.I. Ant as he collects bundles of cash for Captain Rat. A well-made and interesting puzzle platformer, Pushover is ultimately killed by a lack of competitive push, pun fully intended. Pushover is best described as a game of dominoes. 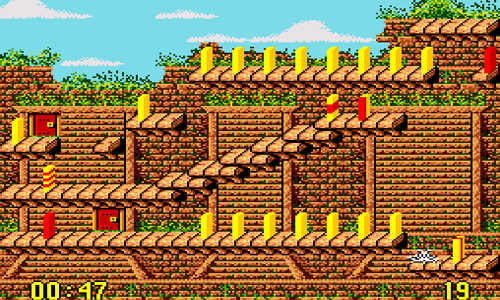 The main objective of each level is to knock all of the dominoes over, though it’s not as simple as simply pushing each one down. You only have one push, though you can infinitely adjust the position of all the dominoes. The other catch is that the last domino knocked down must the one marked with three red stripes. 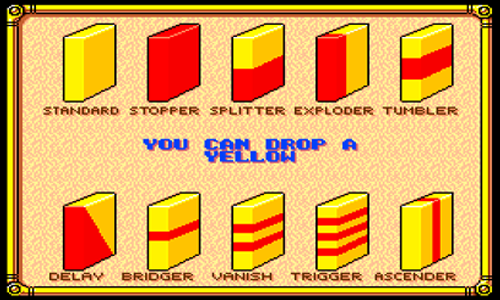 Most dominoes are simply yellow, but many are also marked with different patterns which have several effects. Some continue to flip even after pushing them, others destroy and repair gaps and one even floats into the air. The challenge, then, comes from figuring out how to place dominoes in order to ensure the trigger falls last, which consequently opens the door into the next level while also completing the puzzle before the time limit. Rinse and repeat for 100 levels, and that sums up Pushover pretty well. However, it’s clear that there’s been a bit more care taken than that description implies. Many of the puzzles feel clever and individual from each other. Some can be finished in the blink of the eye, while others require speedy reflexes and multiple movements as dominoes are falling. The various types of dominoes contribute to this, as each domino type changes the nature of the challenge. Red Stopper dominoes can force you to make on-the-fly adjustments as dominoes are falling, dominoes can be dropped on Tumbler dominoes without causing them to implode and Delays can be used to help stagger the falling while you make adjustments. 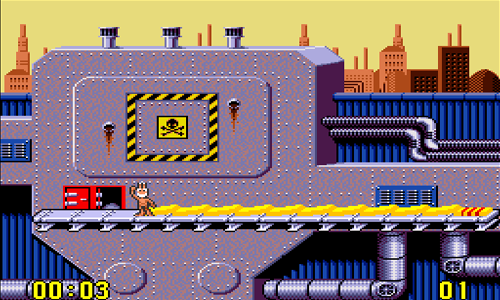 Though creating 100 different levels may seem like a tough task, Red Rat Software has done a good job of keeping the game interesting. 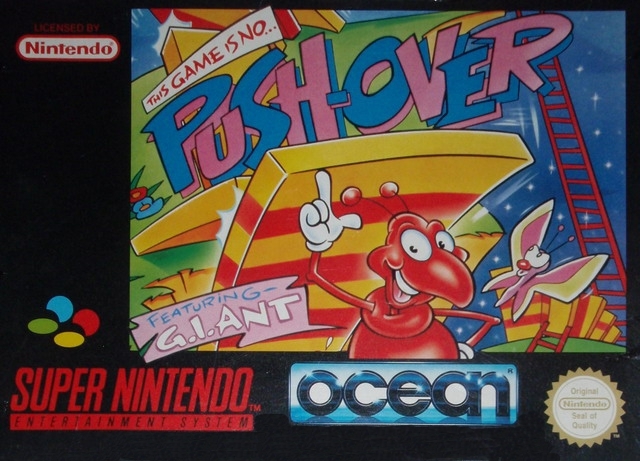 As a blend of puzzle and platforming, Pushover mostly works. The difficulty curve climbs up pretty naturally: opening puzzles are pretty self-explanatory and can be completed with ease, and each puzzle gradually increases in difficulty until the final brain teaser which masks all the dominoes. 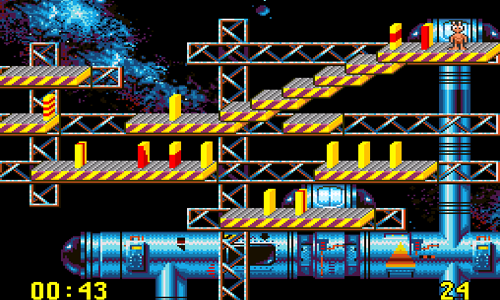 The platforming is solid but sometimes a bit clunky. Movement is speedy, but G.I. Ant lacks any jumping capabilities and can often die from steeper falls, resulting in failure. Ladders allow access to higher areas, but steps which span multiple levels can be clunky to navigate, as it’s somewhat difficult to climb off mid-ladder. Knocking dominoes over also is a bit of an issue, as with so many dominoes in one level it can become frustrating lining Ant up with the domino you need to push. Still, it never borders on frustrating. Unfortunately, some issues mean that Pushover doesn’t quite compete with the kings of puzzlers such as Tetris. The biggest issue is that it lacks the addictive elements which keep you coming back, directly due to the lack of a scoring system. Though levels are timed, you earn no extra reward for completing it quickly, meaning there’s little reason to return to puzzles once you figure out their solution. This also presents another flaw, as while solutions can be difficult to figure out, Pushover lacks the intense nature of its competitors, as a Password system allows you to return to any puzzle whenever you please. Worse, completing a level rewards you with a token, allowing you to restart right before your push. Should you fail a second time, the puzzle can be restarted anyway. 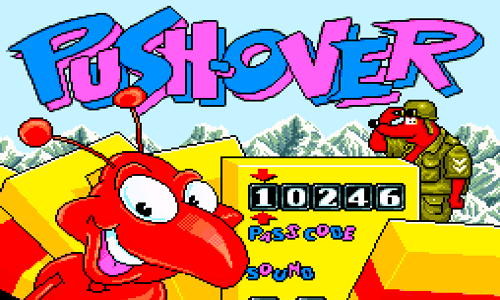 Pushover takes place over a variety of worlds, as every ten or so levels, a bundle of cash is found and the backdrops change. From Aztec ruins to a colourful Meccano world, each feels colourful and well versed with catchy music. Dominoes are clearly marked, which is crucial considering the importance of their consequent effects. The only source of contention is G.I. Ant himself, who becomes grating pretty quickly. Whether it’s the irritating yelps he makes when you pick up a domino, the annoying scream he makes when you fall from a moderately high distance, or the attitude-filled moan he pulls when you stand still, anything this little ant does is far from charming. It can also affect gameplay too, as the unnecessary animation he performs when a door unlocks wastes seconds of time. Pushover makes an admirable attempt to change the puzzle genre, but in trying to do something a bit different, it somewhat forgets what makes puzzle games good in the first place. It may be clever in its design, and avoids repetition for the most part, but it lacks the intensity and addiction of the best in its field. While the 100 levels certainly won’t be breezed through, there’s very little to bring you back due to the lack of a scoring system. The game also feels a bit forgiving, as despite complex challenges, the infinite replays and password system mean most of the challenge comes from figuring out the solution. Though this version avoids the perils of many sponsored advergames, it still isn’t up there with the best in its genre.